My name is Christian M. Stueber. I’ve been married to my wife Blake for over 17 years. We have two children, Zada, 12, and Seth, 9. We are a family of Cross Fitters! My day job is in Information Technology and my night jobs find me volunteering for the Cub Scouts, training other CrossFit athletes, watching movies or playing card games. I was introduced to CrossFit through my employer. They held what are called “Lunch n Learns” where they bring in speakers to talk about different ways to improve your health or be better employees. At one such event, I meet Grant Soletski and Jake Plennes and they discussed CrossFit. I was mostly unmoved until Grant called me “fat”. He didn’t do it in a mean way, he was just describing my physical appearance. 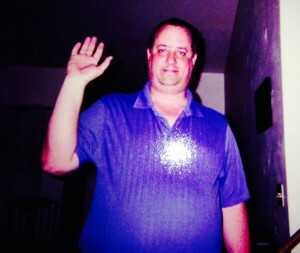 And at 280+ pounds, I was morbidly obese, not just fat. WHAT WAS YOUR STATE OF HEALTH BEFORE BEGINNING CROSSFIT? WHERE ARE YOU NOW OR WHAT PROGRESS HAVE YOU MADE? When I started CrossFit, I weighed 280 pounds, couldn’t run 100 meters without getting winded and was generally in very poor physical shape. A few months prior to starting CrossFit, I had my annual physical. At this exam, my resting heart rate was about 100 beats per minute. Today, I run 5ks in under 25 minutes, have a resting heart rate of about 50 and weigh in at 180. I can lift heavy loads and move them with a sense of calm as my strength has increased immensely. On-ramp was an amazing experience. I met some incredible people, athletes and coaches, learned the techniques of lifting and the various CrossFit movements. I was also introduced to the Paleo diet. On-ramp wasn’t easy. It showed me how poor my physical shape had gotten. Regular classes at first were intimidating. During on-ramp, you learn a skill and then apply it with another skill to perform the workout of the day (WOD). Regular classes are more or less the same but there may be more movements or movements that you have forgotten since on-ramp. There’s also athletes of various skill levels and while I have yet to meet one that isn’t friendly or helpful, in the beginning not knowing them adds to the stress level. But the coaching staff at CrossFit Green Bay helped along the way. They made sure that I adjusted the WODs to my skill level, whether it was by reducing the weight on the bar or by doing a different movement, the coaching staff was amazing. CrossFit is unique for several reasons: First, every day is different, which keeps things exciting. Second, the community is incredible. The athletes and coaches are all friendly and nice. They all provide encouragement and help. Finally, the ability to scale a workout so that any person, at any skill level can push their boundaries and benefit from a WOD is a huge thing that makes CrossFit unique. These elements helped make me be successful at CrossFit along with my own personal goals. And having goals made me successful! I saw results from CrossFit within the first few weeks. CrossFit Green Bay stands apart for several reasons. The dedication of the staff to the clients. Second is the fun atmosphere that the box provides. Third is the sense of community that CrossFit Green Bay has. Finally, the programming is amazing and challenges you in new and exciting ways every day. I’ve performed WODs at plenty of other CrossFit boxes but none of them have made me feel like CrossFit Green Bay. From the staff, to the other athletes that I work out with, I always feel welcome and supported. 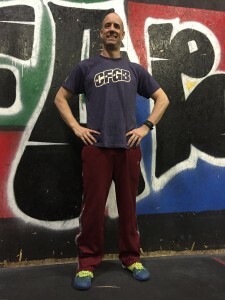 Even when I first started doing regular WODs, other athletes would help me by giving my tips or pointers on my form, on rep schemes or other things to help make the WOD a little easier. As a person that’s been at this point in my CrossFit career, I understand this mentality. I would tell someone else with this mentality that they should start small, talk to the coaches and be smart. In the beginning I would exercise one day on, one day off. Sometimes two days off if my body was telling me that more rest was required. I asked coaches for scaling ideas a lot. I asked for feedback on my form. Gradually, my cardio increased, my strength increased and my abilities improved. They continue to improve. I now workout five or six times a week. I still ask for feedback from the coaches and still scale some of the workouts. To increase my strength, increase my lung capacity (cardio), and have fun. All three things are easy with CrossFit Green Bay. My favorite CrossFit exercise is all of them except thrusters! Thrusters are my least favorite exercise. They just seem to chew me up.